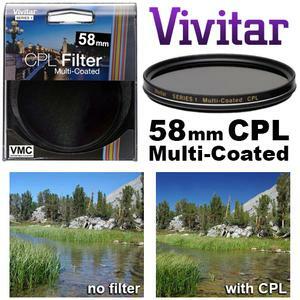 The Vivitar Series 1 Multi-Coated Circular Polarizing (PL) Filter allows you to remove unwanted reflections from non-metallic surfaces such as water and glass, and they also improve color saturation, clarity and contrast. 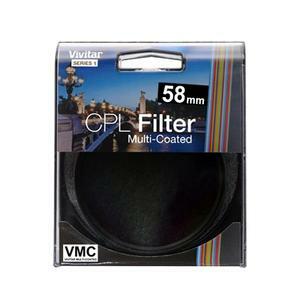 This threaded filter is often used to increase the contrast and saturation in blue skies and white clouds, for example. Vivitar's polarizing filters do not affect the overall color balance of a shot, and they will provide protection for your lens while shooting. 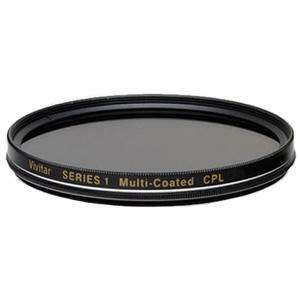 A polarizer is different than most filters in that it is composed of two pieces of glass, mounted independently inside a round frame so that one can be rotated relative to the other. As it is rotated, it increasingly cuts out glare and haze. With an SLR, you can actually observe this change through the viewfinder. Polarizers reduce glare from water, glass, or any non-metallic surface. You can also use a polarizer filter to darken blue skies. Polarizers come in two versions, linear and circular, and autofocus cameras will perform best with a circular polarizer.